Like a series of beached whales, each more decayed and skeletal than the one before, the buildings line the hillside behind Broad Street in SLO. Torn plastic building wrap flaps in the breeze and an incomplete wire fence dissuades, but does not prevent, would-be trespassers from exploring the buildings. 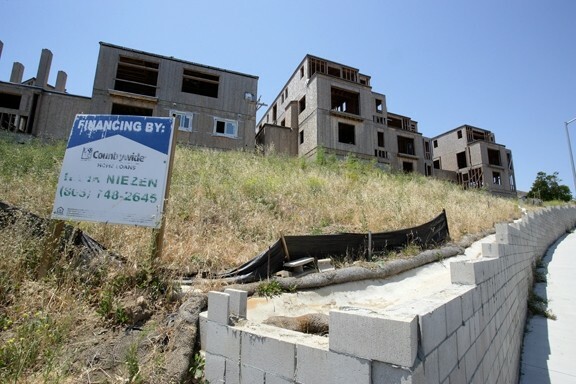 ALONE AND FORESAKEN: This project sits abandoned and unfinished off Rockview Place in SLO, a constant visual reminder of the reversal of fortunes that has hit the county’s housing market. City documents show the project on Rockview Place, which began in 2005, was envisioned as nine condos that would fetch as much as $6 million when sold. But running into foundation problems, among other concerns, work on the steep hillside project was stop-and-go for most of its history and for the past year work has entirely ceased. Now it’s been formally declared “abandoned” by city planners, an extreme rarity in the city, officials say. Developer D.A. Fetyko didn’t respond to relayed requests for comment, but public documents show that the project was among those financed by Estate Financial, Inc., the troubled Paso Robles-based lending company now facing a state investigation and legal actions by investors. The impact of the money-lending crisis locally has been widespread, hitting thousands of local investors and stalling or killing dozens of projects. But the abandoned Rockview Place project is also a headache for city planners, who have had to weigh neighborhood concerns against their own estimates of what it would take to turn the abandoned eyesore into just another block of condominiums. Tim Girvin, SLO’s chief building official, said city staff and the Fire Marshall have been in constant contact with the developer. A recent visit showed there is a wire fence at the site but it doesn’t encircle the project. For now, Girvin said, the developer has been responding to most city requests, but has emphasized that no significant work can happen until he gets new funding. So for now, he said, while the city could legally seek to have the project razed, instead officials are waiting for the results of Estate Financial court actions. “We’re kind of treading water,” Girvin acknowledged. Citizens spoke to express concerns about the project at a city council meeting months ago, but Girvin said since, he hasn’t received much comment on the project from the public. In other communities, building officials said they have not seen a substantial increase in the number of “abandoned” projects, though they said they’ve noted slight increases in the number of stalled residential additions and remodels. Officials in Morro Bay, Paso Robles, Grover Beach, and Pismo Beach emphasized they are required to conform to the California Building Code, unless they have a local amendment that states otherwise. The code requires that, in order to keep a building permit open, a building official must inspect a construction project every 180 days to ensure progress. If progress isn’t shown, a party may request a one-time extension of an additional six months. Barring that, the permit expires and the project can be deemed abandoned.